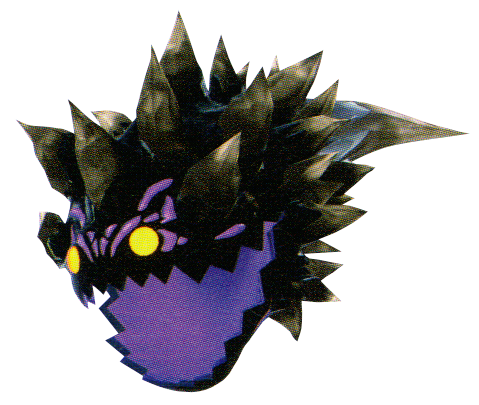 The Earth Core is a Heartless that appears in Kingdom Hearts 0.2 Birth by Sleep -A fragmentary passage- and Kingdom Hearts III. The Earth Core does not generate earthy matter for its attacks. Its face is the only vulnerable spot on its body. Any attempts to attack elsewhere are simply repelled; collision with this Heartless briefly stuns whoever it hits, leaving them vulnerable for additional damage. Should one turn into its Tower form, it can be instantly destroyed if the player uses Goofy Bombardier while locked on to it, this will result in Goofy going into its mouth, destroying it from the inside. Earth Core in Kingdom Hearts 0.2 Birth by Sleep -A fragmentary passage. This page was last edited on 9 April 2019, at 19:46.